The picture above is just one out of many other pictures depicting Trump supporter behaviour towards reporters at one of his recent rallies, posted publicly by Janice Nesbit to Facebook yesterday to which she added the text below. Look carefully at the picture and equally carefully read through the emotional post by Janice, that btw somehow managed to garner thousands of shares, reactions and comments, because within its wide publicity and within the text itself is concealed a truth about the motive for posting it that might elude you for the emotional appeal and obfuscation within its deceptively innocent and zigzag layout. I post afterwards to explain what I think this post is regarding, together with other evidence supporting my position. 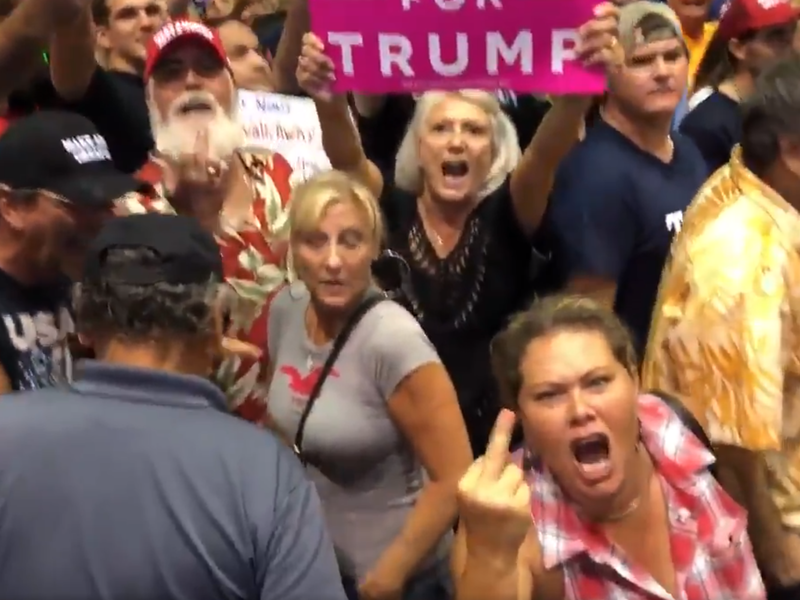 I am disturbed in general with the whole Cult of Gaslight Donald, but when I saw these pictures of his followers at the Florida rally, I had do some deep thinking. I have studied Psychology extensively and nothing in those books could have prepared me forthe last two years. I have lost friends I have known for 17 years, family members that I don't recognize anymore, people filled with apathy, conspiracy theories and rage. Take a good look at these pictures. The rage in the first woman's face looks practically demonic. You could almost label this picture WRATH. They are screaming at a journalist from CNN, egged on by their chosen one. They screech at a man who represents the mainstream media. Journalists that have college degrees. Pulitzer Prize winning journalists who fact check for a living. Sure they may be biased at times, but they all follow the rules of reporting. They get their information from well established Intelligence Communities, Law Enforcement Agencies & first hand witnesses in the field. Checked, and fact checked triple times. They are held to the highest of standards. Rush Limbaugh and the heinous Alex Jones who continues to torture the grieving parents of the murdered children of the Sandy Hook Massacre, claiming that it was all a hoax and publishing the addresses of these grieving parents for these nut jobs to harass. Some of the family members were forced to move 7 times. These women are filled with rage because they have allowed people to mislead them. They undoubtedly were filled with racial hatred to begin with and when Gaslight Donald came along, it was as if he poured gasoline onto their fires. He preyed upon their racism and economic and psychological vulnerability to grow a base that would keep him in power at all costs so that he could personally enrich himself and his family. They are so engulfed in their anger and hatred that they can't even see that they are being conned. Conned by a man who's only agenda is to make sure he and the 1% attain the most wealth that they can possibly attain and I would venture to propose that he is also trying to destroy democracy as his behavior is becoming more and more fascist and autocrat endorsing. I am torn, because I believe in our freedom of speech but the prevalence of these Conspiracy Networks is causing harm to real people. It has brainwashed 30% of our electorate. It has emboldened foreign adversaries to interfere in our elections to add more gas on the fire. What are we to do? I think major changes are going to be made going forward when this nightmare is over. I would love to hear your own thoughts. Now, according to my experience, and that of many others, Trump is not in the least wrong in insisting mainstream media is "fake news media" because no other kind of news media is more deserving of this label. The problem with Trump being the messenger here is this, that when the term is used by the wrong side (Weird Donnie and his weirdo supporters of all people) it can and is in fact being abused to make the label look inappropriate for mainstream media. Anyone noticed how quickly the quotes about the importance of a free media for democracy, freedom, et al, have poured in? A quote from Thomas Jefferson was one of the many I have seen the past days on Twitter and Facebook alike. Question you should ask about these quotes from figures many hold in high regard is whether the context in which their words of wisdom are being used would have appealed to their sensibilities. Who, with their intelligence and wisdom, would they side with if they existed today and knew of the wiles of corporate media? If you read through the remarks made by Janice Nesbit you would have noticed that It starts off hailing journalists in the employ of CORPORATE MEDIA, and though this seems innocent in and by itself, it really needs no mention that the journalists she holds in such high regard are not friends of us the grassroots of the masses as soon as they start working for corporate entities that have never served public interest, regardless how well trained these journalists are or how well intentioned their efforts. Something is fishy here. Those who have kept their eyes open will remember the genesis of the label " fake news" and who it was designed for. The label was most probably created and propagated by mainstream media itself at the exact same time the proliferation of alternative news outlets started, and it was most definitely intended for these. I remember in the aftermath that there followed a time, at the zenith of the use of this term, when it trended even, that governments in the west started taking pot shots at alternative news outlets and many were removed from social media or seriously curtailed. We the public reacted by throwing the label back at mainstream media and ... surprise surprise ... we won! The strength with which the campaign to paint corporate media in a better light is being waged tells me this victory is now in peril. Figures high up in authority have weighed in on the debate and are all pointing out how unfair it is, how undeserving mainstream media is of the label, and, crucially, we are being given a first-hand glimpse of how those vilifying mainstream media look and behave (white trailer trash? ), complete with a leader who happens to already have renown as a nut job. This, I think, is what the fuss about Trump using the lable is about. It's NOT about Trump in the sense instigators of this campaign want to make you believe his use of the term says about him, or what his crazy foaming-at-the-mouth supporters represent (Replica Germans in the nazi era blindly following a small, vile man over the precipice to the destruction of their nation), but about a lable that still inhibits and as such haunts the elite about its media mouthpiece, the shepherd they use to mislead the sheeple that is now less effective because a clear sign alerting all to the whereabouts of the wolf in sheep's clothing, in the form of a "fake news media" label, constantly hangs over it.